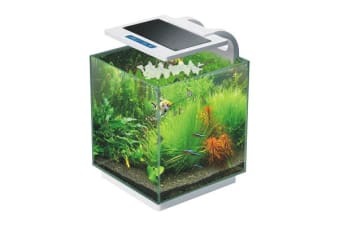 This Dynamic Power 16 litres all in one STARFIRE aquarium is a must have item if you are new to having fish as pet. It comes with a very bright and energy efficient 6W RGB LED light with ON/OFF timer as well as 3 colour mode. 3W water pump with filter, and an intelligent touch control panel with temperature and time display. It is a very user friendly fish tank and from beginners to advanced specialists will love this product! The tank is made from ultra-clear low iron STARFIRE glass with 5mm thickness and this is much more scratch resistant and clearer than acrylic fish tanks. This special glass is much clearer than conventional glass and it gives your aquarium extra clarity to trully bring your fish colour! 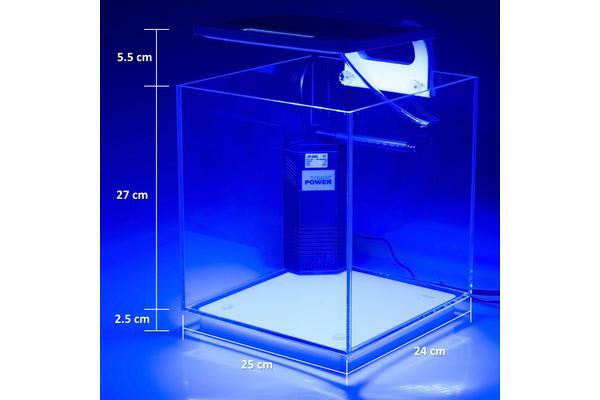 The fish tank will look even more beautiful with your decoration inside because the RGB LED light combined with the clear glass will enhance the colour of your aquarium environment. The 3W, 250L/H super efficient filter with pump is easy to clean and it has a water flow adjuster in order to adjust the water flow according to your needs. It comes with a spray bar in order to circulate the water more evenly and clean the water more efficiently. The aquarium suits both freshwater and saltwater fish/water animals. The size will suit many places, including space limited apartments. Grab this amazing aquarium and add to your living room a touch of beauty and fun! 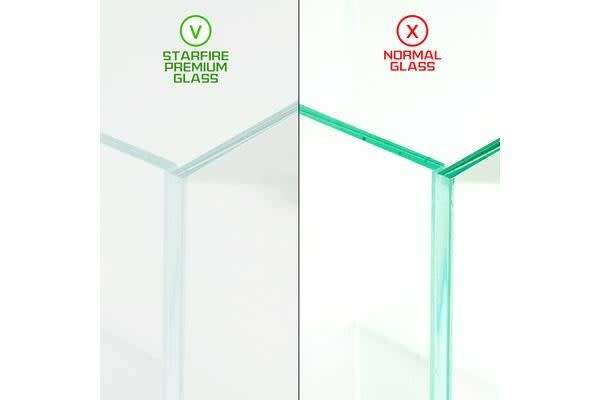 Starfire glass is much clearer than conventional glass and it gives your aquarium extra clarity to trully bring your fish colour! *Pet fish, plants, gravel not included.